The sounds of Mishenichnas Adar permeated the hallways throughout the main JEC campus at 330 Elmora Avenue on Monday as JEC Lower School Principal Rabbi Uzi Beer led the sixth grade boys from classroom to classroom singing and dancing and collecting more and more students along the way. The train snaked its way through the building until it reached the gym, where all the grades broke out into their own circles for continued dancing and finally a Rosh Chodesh assembly. 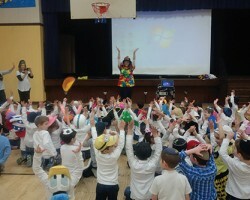 Rosh Chodesh Adar coincided with the 100th day of school, which was also celebrated with Crazy Hat Day throughout the division. Almost every student and teacher donned a crazy hat, while some enthusiastic teachers took it a step further and were almost unrecognizable in their elaborate costumes. The day brought an array of fun activities for the students, including a gala carnival hosted by the sixth grade girls class for the entire division. There are plans for unique and exciting activities for every day of the month to ensure a joyous Adar for all.